The styling of the new timepiece deliberately takes its cue form the design of the legendary P’6910 Indicator. The Porsche Design Chronograph offers a compellingly technical look and innovative material combinations. Fashioned from self-coloured or black PVD-coated titanium, the P’6930 Chronograph is powered by a highly accurate COSC-certified automatic movement. The P’6930 Chronograph's impressive-looking case measures 47 millimetres in diameter and is fashioned from titanium. 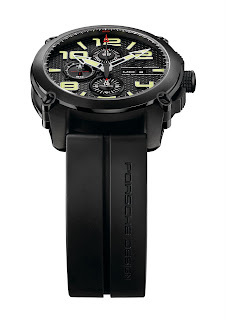 Particularly light and corrosion resistant, the material is characteristic of Porsche Design. The bezel and sapphire crystal caseback envelop the titanium case in a rugged grip. Four screws ensure the integrity of the case and underscore the watch's masculine appeal. 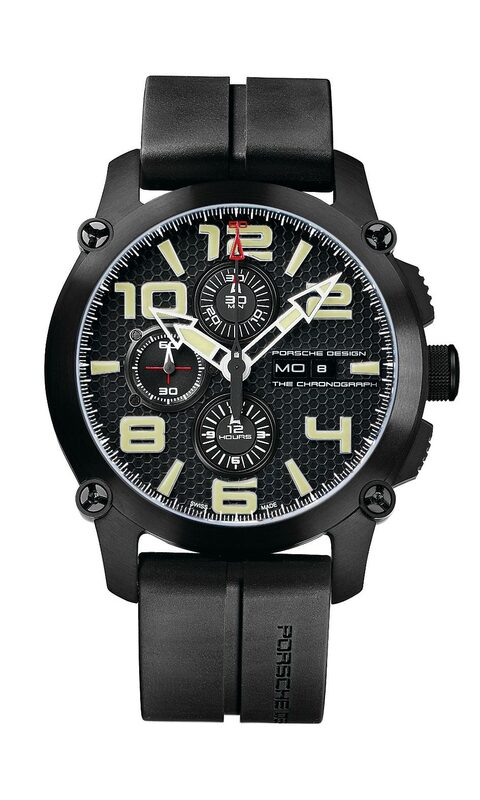 One version of the chronograph features a blend of self-coloured and black PVD-coated titanium. Another version comes in an all-black finish. The resilient black PVD (Physical Vapour Deposition) coating is the outcome of a vacuum-based process that creates a condensate which leaves a protective matt-black deposit of metal nitrides on the watch. Like the P’6910 Indicator, the styling of the P’6930 Chronograph takes its inspiration from design elements of the Porsche Carrera GT. Built between 2005 and 2006, this high-powered sports car is a demonstration of advanced engineering and represents the distilled essence of 60 years of motor racing history. 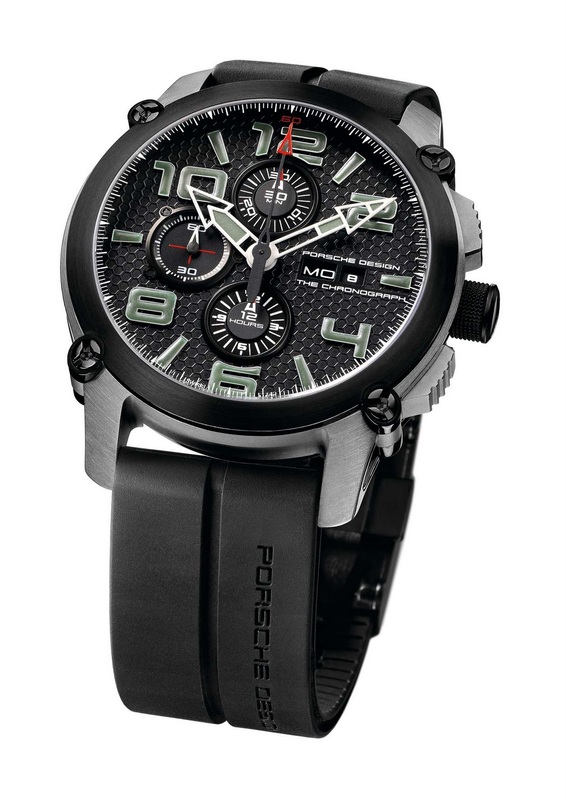 The Porsche Design P’6920 Rattrapante from the Indicator collection is a recipient of the Red Dot Award. The two push-pieces of the P’6930 Chronograph are modelled on the pedals of the Carrera GT and offer superb grip. The same goes for the Clous-de-Paris screwdown crown finished in black PVD-coated titanium. The interior profile of the natural caoutchouc strap sports a tyre-tread design, allowing air to reach the skin; it comes with a folding clasp fashioned from PVD-coated titanium. The automatic Valjoux 7750 movement features an energy-optimised rotor system designed to evoke a Carrera GT wheel rim; it can be glimpsed through the sapphire crystal caseback. Characteristic of all Porsche Design watches is the purist design, typography and colour of the dial, which facilitate crystal-clear legibility in all conditions. The main hands are partially skeletonised to prevent any obstruction of the indications. The coating of green and white luminous material on the main hands, numerals and indices ensures optimum legibility at all times. The Porsche Design P’6930 Chronograph is powered by an ETA Valjoux 7750 automatic movement and is furnished with a certificate of accuracy issued by the independent Swiss Chronometer Testing Institute (COSC).